Hi all! Today I’m going to review a few products by Sunwarrior – a company that produces plant-based vegan protein powders and various other biologically active supplements. I’m not usually big on taking protein powders and supplements, but this time I decided to test a few products by Sunwarrior after learning that they are an all-vegan company, and aim to use only ‘clean’ ingredients. The subject of vegan athletic nutrition rings close to home for me these days as I’m getting closer to my second marathon since going vegan (third marathon overall). It’s been proven many times over, including with my own experience, that being vegan is in no way going to put limitations on how well we can perform in endurance sports including running marathons. But one thing I often see people getting confused over is whether or not they should use supplements while training for endurance events, from 5k to ultramarathons. I have to admit that I’ve never taken protein powder as I was training for my 2 previous marathons and 7 half-marathons because I never felt the need. In fact, since I try to stick to the idea of ‘eating clean’ for best recovery, I make an effort to eat as much whole, minimally processed plant foods as possible as I’m getting ready for Rock’n’Roll Seattle marathon in less than a month. One of my next posts will be about what I eat on a long run day that helps me recover so quickly that I can have a strength training workout at the gym the very next day (stick around! ), but for now let’s just say that I give a lot of credit for my speedy recovery to eating plant-based. The biggest issue I see with most protein powders? Their ingredients list! Yes, the ingredients have to be processed in order to fit into that bottle and remain shelf-stable for years, but it seems like some brands go overboard with adding unpronounceable chemicals, preservatives, etc. Besides, as a plant-based vegan I want to see only vegan-friendly components list on the package. I’ve heard of a couple all-vegan brands that are widely used by other fitness-inclined vegans, but haven’t tried those until Sunwarrior reached out to me and sent me a sampling of their most popular products to try out. I was a bit skeptical at first, but then I checked out their ingredients lists online (they are legit) and decided to give it a go. Raw Organic Ormus Supergreens powder – a mix of cold-dried organic Alfalfa, Barley Grass, Wheat Grass, Oat Grass, Spinach, Parsley, Moringa, and Ginger Root. The cold-drying process allows to retain the delicate heat-sensitive enzymes and phytonutrients, which ensures that the final product is “a superior green superfood beverage that is alive, raw, and bio-available”. I’m saving a pack of Ormus Supergreens to take in right after my marathon in a month to kick-start recovery. A blender bottle with a wire whisk – a leak-proof seal and a ball-shaped wire whisk make it easier than ever to mix any of the above mentioned powders with liquid. You’ve probably seen every jock at the gym carrying one of those bottles around. The easiest way to add my supplement samples to food was to use them in smoothies (a shocker, right?!). Both the chocolate and vanilla-flavored protein powders turned out to taste pretty good in my breakfast smoothies, and I especially appreciated the extra protein after my Sunday morning long runs. I tend to put too much stuff into my smoothies, sometimes stopping just short of dumping in leftover mashed potatoes (hey, that’s healthy carbs!). As a result, often my smoothies taste quite funky, to say the least, which causes Rob to make smartypants comments and even refuse drinking them. Thankfully, the Sunwarrior protein powders added just enough of a nice chocolate/vanilla flavor boost to my smoothies, and Rob even went on to compliment them! That was like music to my ears :). I used about half of a single-serving packet per smoothie. Yep, that’s my funky smoothie there! 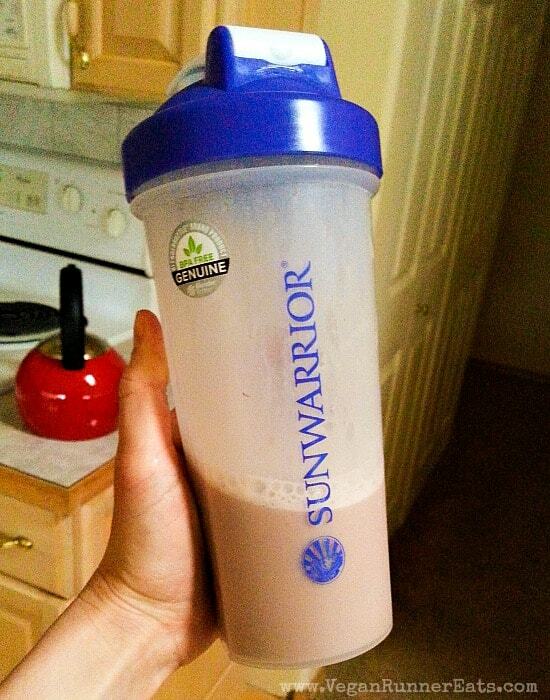 Another great use for Sunwarrior protein powder – making a quick postworkout shake. The majority of my workouts happen after work between 5 and 6 pm, so by the time I get home I’m usually quite ravenous, and that’s all before I even start making dinner. Naturally the demand of pre-dinner snacks is high in our house. Trouble is, I often just dive straight into the peanut butter jar to kill off that hungry feeling quickly (plus, who doesn’t love to eat peanut butter by the spoon? ), and proceed to make dinner. As a result, the cold, fatty peanut butter mass in my empty stomach causes it to feel less than happy. I’ve been experimenting with other types of food as a postworkout/pre-dinner snack. This is when I discovered that half of a packet (1/2 serving)of Sunwarrior protein powder mixed with about a cup of almond milk agree with my stomach nicely and diminish my hunger until the dinner is ready. The blender bottle makes mixing them together a breeze. There was also a time when I got adventurous and mixed in some chia seeds. Let’s just say that my proportions weren’t perfect, but the potential for a protein-chia seed pudding was there! If you decide to make this pudding at home, use no more than ½ cup of nondairy milk, 1-2 Tbsp of chia seeds, and 1-2 Tbsp of Sunwarrior protein powder. Let sit for 5-10 minutes to allow the chia seeds to plump up, and enjoy! As for the sprouted barley and Ormus supergreens powders, I found them the easiest to use in smoothies as well. I can see that they can be mixed with water/nondairy milk for a postworkout recovery drink, but I used up my samples in smoothies before I ever got a thought of making them into a drink after my exercise sessions. All in all, I had a positive experience with Sunwarrior products. I found that the flavors were pleasant, the ingredients lists not too confusing, and most importantly, the powders agreed well with my stomach that can be quite fussy at times. I also appreciate the fact that Sunwarrior makes it a point to create only plant-based products that can benefit everyone, vegan or not. I’ll admit though that I’m not a big consumer of protein powders or supplements overall, and I don’t believe that we HAVE TO consume them to be healthy. 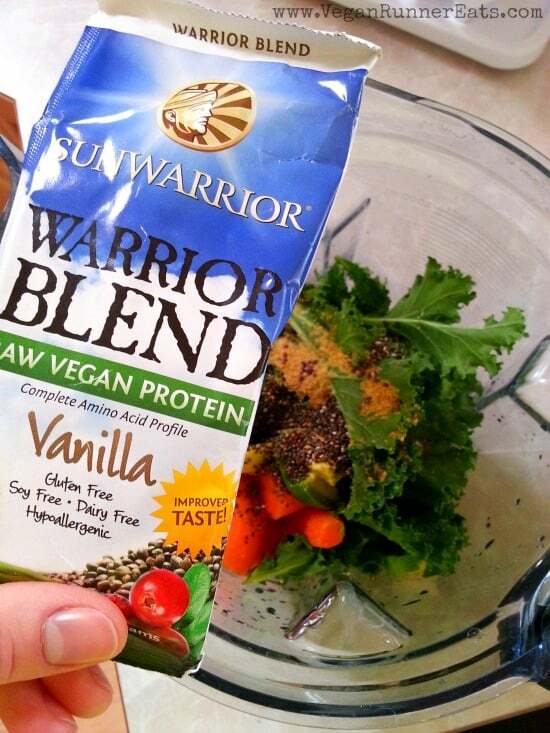 To each his own, of course: if you decide that you’d like to add a protein powder to your vegan/plant-based diet, you can be sure that Sunwarrior most likely has a product fit for your needs. Question for you: Have you ever used any nutritional supplements – protein powders, multivitamins, etc.? Please share your experience in the comments below! 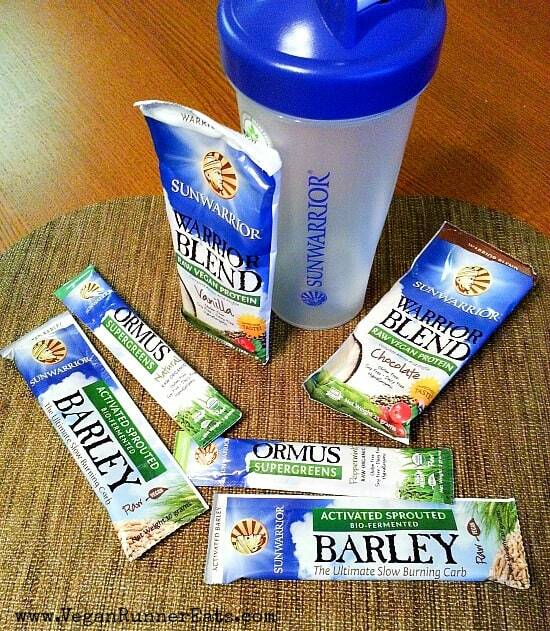 Disclaimer: Sunwarrior provided me with a free sampling of their select products for free in exchange for a review. All opinions are my own. Tagged marathon training, recovery, vegan nutrition, vegan protein. Bookmark the permalink. Which was your favorite flavor? I purchased there unflavored about a year ago and ended up dumping it because it was really unpleasant to all who tried it. Thinking one of the flavored ones might be better? April, I liked the chocolate flavor the most because I just gravitate towards anything chocolate 🙂 However, I noticed that if you mix it with something already sweet (like vanilla almond milk), then it may taste too sweet. So something like unsweetened nondairy milk or water should be best. I love plant-based protein powders!! I use The Garden of Life RAW (from Silverdale’s Maxx Nutrition) and Perfect Fit Protein (by Tone It Up). I normally make morning shakes… my favorite as of late: 1 banana, 1-2 handful of frozen berries, 1 scoop RAW vanilla protein powder, 1 spoonful unsalted peanut butter (I love CB’s from Central Market), unsweetened cashew milk, and ice. Sometimes I’ll throw a handful of spinach into the mix. That sounds tasty, Ger! My basic recipe is similar, only I tend to overcomplicate it with all kinds of veggies 🙂 And protein powder is a rare guest in my house. Deepa, I’ve got to say that kale and carrots taste surprisingly fine along with everything else I put into our smoothies. As long as there’s something sweet like berries and/or dates, the flavor of those greens/vegetables stays toned down.